Dexterously crafted, our range of marble Radha Krishna statues are reckoned by our global clients for the elaborate hand work and perfect carving exhibited by our creative spurs. These statues come in various specifications such as shape, size, posture and others as per the client's request. Our range of Marble Krishna Standing Statue are carved beautifully from the finest marble to ensure long lasting value and aesthetic beauty. These Marble Krishna Iols come in various specification such as shape, size, posture and others as per the client request. 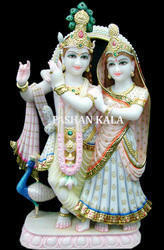 The statue has a charismatic aura about it and is perfect for gifting or placing in temple. We hold the expertise in exporting White Marble Sai Nath Statue. The untiring effort and constant support has enabled us to come out with the flawless statue of White Sai Baba. We use marble and other white crystals to carve these statue. 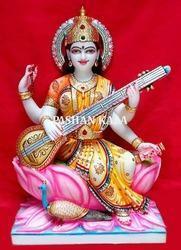 This statue is a representation of peace and can be placed in temple and other holistic place. We offer excellent quality statue of marble Ram Darbar which is crafted from top notch quality marbles to ensure that the statues last long. The ecstatic workmanship reflects the creativity of our craftsmen and their quest for achieving artistic perfection. Understanding the differences in client demands, we undertake tailor made solutions to craft the statues as per client need. We are known in the industry for offering statues of Beautiful Marble Radha Krishna Statue that are very artistically made. 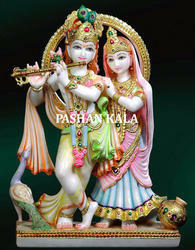 Best quality marble and latest tool are used to carved these Beautiful Marble Radha Krishna Statue. Made available in different size and finishes, these product are offered in premium packaging, so as to ensure their safe delivery. We are engaged in offering high quality Marble Satya Sai Baba Statue which is made from high quality raw material. These are the best as these are manufactured from high quality raw materials. Our Satya Sai Baba are customized as per the specifications of our client. Our Marble Meera Bai Statue are reckoned for fine artistry, perfect finishes and superior craftsmanship. The work on the sculpture reflects the artistic sensibilities of our creative spurs. Carved using high quality marble our range is appreciated across the globe and can be availed at industry leading prices. Our range of Marble Sreenath Ji Statues marble statues are carved beautifully from the finest marbles to ensure long lasting value and aesthetic beauty. These statues come in various specifications such as shape, size, posture and others as per the client's request. We put forth Marble Swami Narayan Statue that is made using high quality marble sourced from trusted vendor of the market. These are made by our adroit craftsmen and can be availed at cost-effective price. Our artisan quality test these in compliance with international standard of quality. 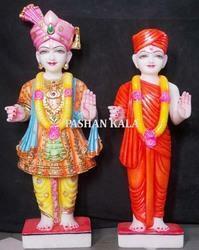 Our Marble Swami Narayan Idols are highly demanded by our customer throughout the world. 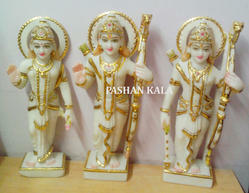 We are engaged in offering high quality Marble Veerbhadra Statue which is made from high quality raw material. These are the best as these are manufactured from high quality raw materials. 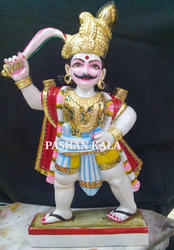 Our Veerbhadra Statue are customized as per the specifications of our client. Avail from us an exquisite range of Goddess White Marble Durga Maa Statue, which is crafted with intricate precision and superior finish. Regarded as the epitome of traditional craftsmanship and ultramodern design techniques, these Ambe Maa Idols are widely demanded by our clients spread across various parts of the globe. 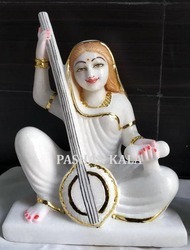 Our artisans craft these statues with perfection to make it look elegant and magnificent..
One can avail from us a wide range of Saraswati Marble Statue, which display the talent of our artisan. Uses of unmatched quality white marbles make these Marble Saraswati very durable and appealing in look. The features of the statues are carefully designed using advance carving and cutting tools. We are engaged in offering high quality White Marble Sai Baba God Statue which is made from high quality raw material. These are the best as these are manufactured from high quality raw materials. Our Sai Baba are customized as per the specifications of our client. 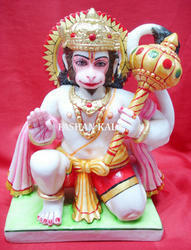 We have used the standard quality of marble to manufacture the Marble Hanuman Sitting Statue. As a manufacturer we are engaged in manufacturing and exporting the statue which passes the test of quality so that we will provide standard products to our customer. 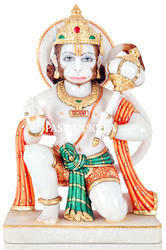 Our range of Hanuman Ji Statues is highly appreciated for its beautiful design and appealing look. 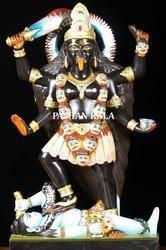 Our Black marble kali mata statue is manufactured from black marble and is available in attractive designs and styles. Our Maha Kali Statues are available in smooth finish and excellent finish. We have employed expert professional in the company, who use their creative idea and design in crafting stylish marble product. 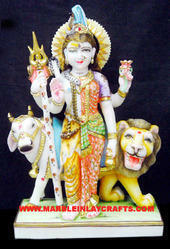 Beautiful Marble Ram Darbar Statue is the epitome of ideal and considered as the righteousness itself. He is the central character of the great indian epic ramayana, hence, the soul of india . Ram is most of the time not depicted alone but along with his beloved wife sita, dutiful younger brother lakshmana, and a great devotee hanuman in ram darbar. We are involved in crafting, supplying and exporting a wide range of Beautiful White Marble Hanuman Statue. These are designed using quality marble, sourced from the most reliable vendors of the market. We have all requisite hand tools and machines to craft the Statues in various designs and sizes as per the demands of our clients. All our products are offered at industry leading prices. Lord Shiva & Parvati and Marble Ardhnareshwar Statue is considered to be the bearer of luck and prosperity, and worshipping him daily brings both to the devotee. To celebrate the glory and charm of Lord Ardhnareshwar Idols, we offer premium quality Marble Ardhnareshwar Murti that are made from premium quality marble stone that offer premium polish and long lasting luster to them. 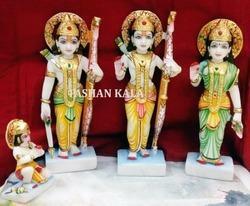 Looking for Marble God Statues and Wooden Temples ?